"Poohsticks" is what you might call entry-level hydrology. Drop twigs over a bridge on the upstream side and then race over to the downstream side to see which bits of wood appear first. Good fun, for sure, but the scientist in you may also learn something about stream behaviour. This is essentially what Delft University of Technology's Thom Bogaard and Rolf Hut have been doing in Myanmar. Together with local students, they've been playing a kind of poohsticks on the Irrawaddy River... with coconuts. Their aim has been to understand how this mighty watercourse moves, how it mixes, how it might disperse and dilute pollution if faced with such a problem. In the West, scientists would resort to all sorts of fancy, high-end equipment that costs hundreds, even thousands, of dollars. "But this is Myanmar; they can't afford that," said Dr Bogaard. "They have no information on water quality at the moment. They know a bit about sediment, but that's it. So, we decided to use citizen science to see how far we could go to get basic data." Start with 300 coconuts. 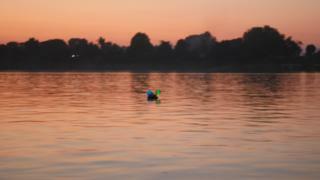 Attach them to coloured balloons that also contain a small bicycle light for visibility at night; and then just throw them in the river. The density of a coconut is almost one, which means it sits submerged at the surface of the water and is driven by the current alone, not the wind. It's the perfect, low-cost ("off the tree", even edible) scientific drifter. Those dropped in the middle of the Irrawaddy will in all likelihood move the fastest; those near the bank will very probably move the slowest. "And what you do is position your student teams on bridges and watch them pass by,” explained Dr Hut. "They just mark the times: 'It's now 09:45 in the morning and there's a blue one, and there's a white one'. What you see is a curve develop at one bridge, and then this bell shape gets broader at the next bridge. And that allows you to say something about the average changes in velocity between the bridges." Media captionRolf Hut (L) and Thom Bogaard (R): "High-end tech is not the only solution"
It's not enough of course, so Bogaard, Hut and their band of students and technicians - from Yangon Technological University and Myanmar Maritime University - upped the level of sophistication. This took the form of a block of wood topped with styrofoam. To this platform they attached a waterproof plastic box containing a GPS tracker, data card, and cell transmitter - the sorts of components that the Western "maker movement" (DIY technogeeks) like to play with all the time. The whole contraption - still costing less than $150 - is weighted to sit in the river properly with chunks of metal cut from an old car. This drifter can report its own position and velocity as it heads downstream. The group used 15 of these devices at the confluence of the Irrawaddy and its major tributary, the Chindwin. The latter carries more sediment and contaminants, but it takes many kilometres before these become fully mixed in the Irrawaddy. The data gathered earlier this year will now be used to model the river's behaviour, to better forecast how a pollution incident might propagate in time. "The ultimate aim is to make sure the local people can do this kind of thing themselves," said Thom Bogaard. "To be honest, it takes quite a bit of experience to know how to build these makeshift devices, but I think we've got them started. We had about 10 students and local technicians and it was a fabulous success. We were able to discuss how we do the science and you could see them flourish and get the mindset that is needed to monitor a river like the Irrawaddy." Image caption If it breaks, fix it! But Rolf Hut doesn't want this approach to be seen as some kind of patronising hand-me-down. He's adamant that "tinkering for data" should be in the arsenal of every scientist, wherever they work. "For a lot of applications in the Western world it's just beneficial to have lower cost, tinkered sensors because it opens the opportunity to get far more geo-scientific data than would otherwise be possible. "Too often people think they need to buy a standard device and if it breaks they have to send it away and wait for it to come back. No! Fix it; make something of your own. Use a coconut!" Thom Bogaard and Rolf Hut presented their work in Myanmar to the recent European Geosciences Union (EGU) General Assembly. A video recording the project is on YouTube.